To the Berlin-based art collective Raubdruckerin, city streets are literally their artistic inspiration. 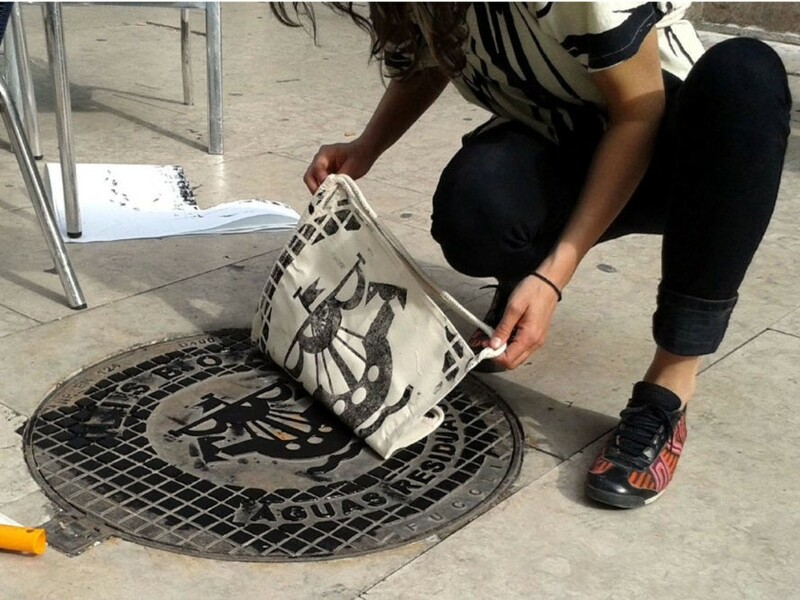 Translating to “pirate printer,” the group uses city infrastructure as printing elements to create truly unique tote bags, t-shirts and backpacks. Decorative and utilitarian manhole covers, grates, and other metal pieces affixed to the street are slathered up with printing ink on the spot before being imprinted with fresh clothing, making true street pieces that honor the cities they are made in. Raubdruckerin finds beauty beneath their feet, seeking out graphic patterns, interesting lettering and bold lines on the ordinary metal utility covers found on urban streets. The group travels to different cities in Europe to capture the unique patterns and markings belonging to each place. The manhole covers of Berlin were the first inspiration for the project, in their beauty and diversity. The covers in the historic Mitte district bear etchings of the city’s architectural monuments, while the neighborhood of Neukolln feature geometric patterns, and Friedrichshain’s covers have circular patterns that resemble Mayan imagery. The group has also printed bicycle signs in Amsterdam, and ship covers in Lisbon, as well as more simplistic utilitarian grates in all cities. With the city as inspiration, Raubdruckerin’s process is just as interesting. Once an interesting piece has been found, the group sets up shop right their on the street. As in traditional screenprinting, a printing area is blocked off, then ink is rolled on. The chosen fabric piece is then carefully laid onto the inked surface, and rolled to set the ink. The resulting pieces are guerilla souvenirs from the cities themselves, and available through the group’s online store. what kind of ink do i use to transfer on to t- shirts, totes.?? - thankyou. To the Berlin-based art collective Raubdruckerin, city streets are literally their artistic inspiration. Translating to �pirate printer,� the group uses city infrastructure as printing elements to create truly unique tote bags, t-shirts and backpacks. Decorative and utilitarian manhole covers, grates, and other metal pieces affixed to the street are slathered up with printing ink on the spot before being imprinted with fresh clothing, making true street pieces that honor the cities they are made in.